Read about Ankara Turkey then take the easy quiz. Will you remember what you read? However, in the past few decades Ankara has slowly entered the exciting world of tourism. It now boasts of a subtle and more sophisticated air for tourists who would like to take a breather, or completely stay away from Istanbul’s ubiquitous social scene. Turkey’s location at the crossroads of Europe and Asia makes it a country of significant geostrategic importance. Ankara, historically known with the names Ancyra and Angora, is the capital of Turkey since the Ottoman Empire’s fall in 1923. It is the country’s second largest city with Istanbul being the largest. The city has a mean elevation of 3,077 ft and had a population of 4,338,620 in 2011. Ankara is an important commercial and industrial city and is the center of the Turkish Government. The historical center of Ankara is situated upon a rocky hill 492 ft above the plain on the left bank of the Ankara Cayı, a tributary of the Sakarya (Sangarius) river. Ankara is a very old city with various Hittite, Phrygian, Hellenistic, Roman, Byzantine, and Ottoman archaeological sites. The hill which overlooks the city is crowned by the ruins of the old castle, which adds to the picturesqueness of the view. However, only a few historic structures surrounding the old citadel have survived to the present day. There are, however, many well-preserved remains of Hellenistic, Roman and Byzantine architecture, the most remarkable being the Temple of Augustus and Rome (20 BC) which is also known as the Monumentum Ancyranum. With Ankara’s wide and open streets that simply beg to be strolled on, it is not surprising that the city has taken on a cafe culture and it is common to see both locals and tourists enjoying a cup of tea with a selection of fine Turkish sweets. In many of these cafes, patrons still sit down for a game of backgammon while others indulge in animated discussions about politics and the merits of football teams like the Genàlerbirligi S.K. and M.K.E. Ankarag¸c¸, both of which call Ankara their home city. Later in the day, you may fancy a glass or two (or even more if you are brave!) of raki, an aniseed flavored hard liquor that Turkish people love to have as an aperitif. It is taken along with a mezze of meats, cheeses, olives and seafood. Reminiscent of absinthe because of its strong and bitter but aromatic taste, it is also mixed with water to create a milky-white drink that helps it go down easier. Ankara is a haven for those who are seeking to get to know more about history. The city has a number of museums that will definitely feed the culture vulture in you. For starters, visit the Anit Kabir, the mausoleum of Mustafa Kemal Atat¸rk, the founder of modern Turkey. It is located high above the city in a vast marble edifice worthy only of a man this powerful. Inside, you can feel a palpable sense of respect for a person who still has a huge hold on the Turkish people 74 years after his death. If you want to have a taste of Turkey’s ancient past, the Museum of Anatolian Civilizations could be the perfect choice. Going as far back as the Paleolithic era, you will not get a more comprehensive background of Turkey anywhere else. The fact that this museum is housed in a thoughtfully restored 15th century bedesten or covered market only adds to its cultural charm. Forget the tempting lure of renting a car because traffic can be chaotic at peak times of the day. Instead, walk the wide, welcoming streets and get on the bus or tram where you get to meet more people. This is also an easier and more convenient way to get to where you want to go without dealing with the annoying traffic. Since more people take either the bus, minibus or dolmus network, it can be a fun and engaging experience but also a hectic one but it does save a lot on your travel budget. View the pictures and read the article above BEFORE taking quiz. Take this quiz about Ankara Turkey and see how much you’ve learned or remember. This Travel Quiz is about Ankara Turkey. This quiz is a True/False quiz. The level of this test is easy. Turkey is a country you might want to visit, especially if you like different cultures and are interested in ancient history or civilizations. Being at the crossroads of Europe and Asia, Turkey has a unique history and a strategic importance in the world. To learn more about Turkey click the link indicated below which will take you to our main travel site. Thanks for taking this quiz on Ankara Turkey. Ankara is the Turkish capital and a place that embodies many modern and ancient attractions. It is a place that is enjoyable to visit whether for business, tourism or pleasure and it is solidifying its expertise in these areas as the city grows. This city is one with good potential for expanded trade and tourism and it is nice to see it already making progress towards these goals. Ankara is the country’s second largest city, Istanbul is the largest. Ankara is a relatively new city with its own style of architecture. 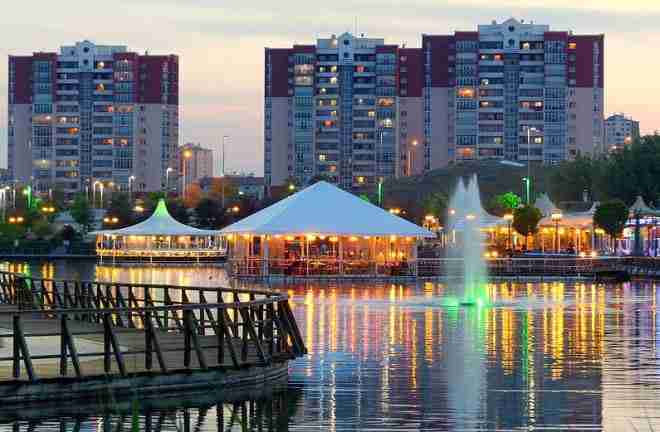 In the past few decades Ankara has slowly entered the exciting world of tourism. Forget the tempting lure of renting a car because traffic can be chaotic at peak times of the day. Ankara Turkey, Ankara Turkey video. Ankara video. Bookmark.